Botanical Significance: Bromeliads can be seen on headdresses of the elite in many ceramic depictions. This plant may have been revered due to their association with hummingbirds, birds that may have been honored for their speed and beauty. Ritual Significance: Bromeliads grow in the vivid oranges and reds that may have been aesthetically pleasing to the ancient Maya. The flowers are very long lived and retain their beauty long after being cut - ideal for use on ancient Maya headwear. Notes: Guzmania lingulata (L.) Mez or Vriesea gladioliflora (H. Wendl.) Antoine B. plumierii? Quesnelia? 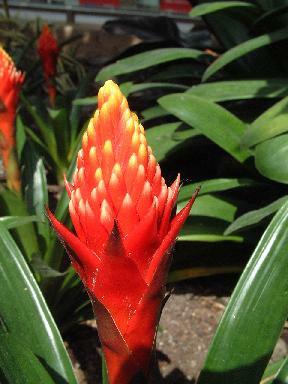 A March '07 study conducted by the author demonstrates that a cut bromeliad (Guzmania) flower lasts in near perfect condition for two weeks without water. This may add credence to the theory that these flowers were cut and used in elite Maya headwear. The flower rapidly declined after the two week period (see photo).